Home » Eastern Lightning , end-time , God's words , Holy Spirit , Jesus , the Age of Kingdom , the church of Almighty God » Inspirational Stories: Woe to the Conservative! There is an ancient Chinese story called “Carving the Boat to Seek the Sword.” It goes like this: During the Spring-Autumn and Warring States periods, when a man from the state of Chu was crossing a river, his sword dropped into the water. He hurriedly carved a mark on gunwale. And after the boat came alongside the bank, he jumped into the water to seek his sword from where he had made the mark. Seeing this scene, people burst into an uproar: The sword doesn’t move but the boat has sailed away. Isn’t it too foolish to seek the sword in this way? The lesson of the story is that things are constantly changing and developing forward, and so if man views things as static and through conservative eyes, he will ultimately gain nothing. Perhaps you deem that it is simply a ridiculous story and there is no such a foolish man in real life. But is it really the case? The answer is no, because such a story has been repeatedly presented in the history of human development, making numerous sinners of all time. Two thousand years ago, that is, at the end of the Age of Law, the people became ever more degenerate and were in the danger of being sentenced to death by the law for committing sins. Jehovah God saw that. He loved the world. Therefore, He concluded the work of the Age of Law and was incarnated as the Son of man in the human world to do the work of redeeming mankind under the name of Jesus, so that man could continue to exist. During His work, the Lord Jesus preached the gospel of the kingdom of heaven throughout the land, forgave man’s sins, healed the sick, cast out demons, and so on. He displayed numerous signs and wonders, which caused an uproar throughout the Jewish state. A lot of people saw, heard, and also spoke of the Lord’s great power and authority, from which many people recognized that the Lord Jesus was the coming Messiah, the ever-existing God Himself with unique authority and power, and thus accepted Him as their God and received His salvation. The chief priests, scribes, and Pharisees of the religious community also heard the preachings given by the Lord Jesus and saw His extraordinary power and authority, but they simply clung to their own conceptions and imaginations, believing that God’s work was forever unchanging and could only remain in the Age of Law, and that God’s name would always be Jehovah, because God once said, “I, even I, am the LORD; and beside me there is no savior” (Isaiah 43:11). They thought that when God came back, He should only be called Messiah rather than Jesus. Therefore, they unscrupulously opposed and condemned the Lord Jesus’ work on the pretext that the name of the Lord Jesus was not that of the Messiah who was prophesied to come and His work transcended the laws of the Old Testament, treated Him as their enemy, and condemned His words with authority as blasphemies. And they blasphemed the Lord Jesus, saying, “This fellow does not cast out devils, but by Beelzebub the prince of the devils” (Matthew 12:24), so as to deceive the ignorant people. As a consequence, the people rose up to oppose, defy, and condemn the Lord Jesus, and eventually crucified the merciful Lord Jesus alive—committed a heinous crime—and provoked the righteous disposition of God. Ultimately, the Jews were expelled from Israel and fled to countries around the world. In the last days, God becomes flesh again and does the work of judgment beginning with God’s family under the name of Almighty God. He expresses a variety of truths to judge and purify man, and brings mankind the way of casting aside their corrupt disposition. 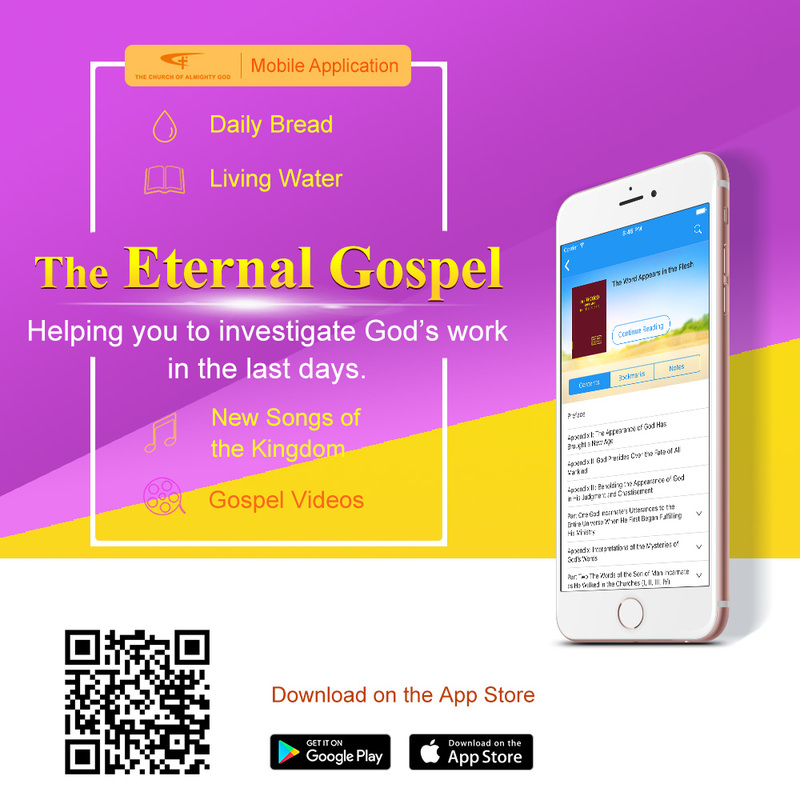 Many people who truly thirst for God’s appearance are certain that Almighty God is actually the returned Lord Jesus through reading His words online, and watching the Church of Almighty God’s videos of hymns and gospel movies, and more. More and more people havereturned under the name of Almighty God. They are being led and shepherded by Almighty God andenjoying the provision of the truth and life bestowed by God, and their life disposition is being transformed gradually. However, some religious people still hold on to the work done by God in the Age of Grace and deny and reject God’s salvation in the last days when they know that Almighty God brings a new age, the Age of Kingdom, does the work of judgment with the word, and no longer heals the sick and casts out demons, andthat God’s name has changed, is no longer the Lord Jesus but Almighty God. They believe that when God comes again, He should still do the work of healing the sick, casting out demons, and forgiving man’s sins, and His name should still be the Lord Jesus, because the Scripture says, “Jesus Christ the same yesterday, and to day, and for ever” (Hebrews 13:8), and “Neither is there salvation in any other: for there is none other name under heaven given among men, whereby we must be saved” (Acts 4:12). They think that only by trusting in and keeping the name of the Lord Jesus, can they enter the kingdom of heaven and gain the eternal life. So they blaspheme, slander, condemn, and oppose Almighty God on the grounds that departure from the Lord’s name and way is a betrayal of the Lord, and they spread various fallacies to deceive and control people and hinder them from seeking and investigating the true way. Besides, they abuse and driveout the brothers and sisters preaching Almighty God’s gospel of the last days, and even call the police and collude with the CCP government to arrest the brothers and sisters from the Church of Almighty God. The Lord Jesus said, “Many will say to me in that day, Lord, Lord, have we not prophesied in your name? and in your name have cast out devils? and in your name done many wonderful works? And then will I profess to them, I never knew you: depart from me, you that work iniquity” (Matthew 7:22-23). As for those who have preached, cast out devils, and done many wonderful works in the Lord’s name, why will the Lord Jesus say that He never knew them and condemn them? The reason is that because of their ignorance of God’s work which is always new and never old and continues to advance, and moreover, because of their arrogance and self-righteousness and obstinately holding to themselves, when they hear the Lord Jesus has returned to flesh and done the work of judgment andchastisement under the name of Almighty God, they not only have no intention of seeking, but alsomisinterpret the Bible out of context, and openly oppose and condemn Almighty God’s work in the last days. That’s why God will call them evildoers. And their ending is self-evident. Today, people in the religious world awaiting the return of the Lord Jesus are just like the man who made a notch on the boat to mark where his sword had fallen overboard. They neither seek nor investigate the words and work of the returned Lord Jesus—Almighty God, but oppose and condemn them, and nail God to the cross again. They repeat the historical tragedy of the Jewish people who awaited the coming Messiah yet opposed and condemned and crucified the Lord Jesus, which eventually led to the destruction of their nation. Isn’t this worth thinking deeply about? Almighty God says, “In each age, God does new work and is called by a new name; how could He do the same work in different ages? How could He cling to the old? The name of Jesus was taken for the work of redemption, so would He still be called by the same name when He returns in the last days? Would He still do the work of redemption? Why is it that Jehovah and Jesus are one, yet They are called by different names in different ages? Is it not because Their work in these ages is different? Could a single name represent God in His entirety? In this way, God must be called by a different name in a different age, must use the name to change the age and represent the age, for no one name can fully represent God Himself. And each name can only represent God’s disposition during a certain age and needs only to represent His work. Therefore, God can choose whatever name befits His disposition to represent the entire age. … There are those who say that God is immutable. That is correct, but it refers to the immutability of God’s disposition and substance. Changes in His name and work do not prove that His substance has altered; in other words, God will always be God, and this will never change. … God is not as simple as man imagines, and His work will not stop in one age. Jehovah, for example, will not always stand for the name of God; God also does His work under the name of Jesus, which is a symbol of how God’s work is always progressing forward” (“The Vision of God’s Work (3)” in The Word Appears in the Flesh). 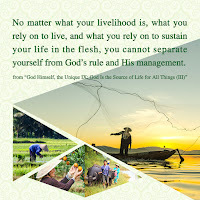 From Almighty God’s words, we can see that God is always new and never old; because of the change in era, God must take a new name to represent His disposition and His work in that age; and although God’s way of working and His name change, His substance and righteous disposition will never change. When God did the work of the Age of Law under the name of Jehovah, He expressed the disposition of wrath and curse, making people at that time know what was sin; when the Lord Jesus came, He condemned and cursed those Pharisees who served God but opposed Him, saying, “But woe to you, scribes and Pharisees, hypocrites!” (Matthew 23:13), allowing people to see that God not only possessed the disposition of love and mercy, but also revealed majestic and wrathful disposition to the enemy force opposing Him; and Almighty God—the returned Lord Jesus—expresses more of His righteous and majestic disposition in the last days. He expresses the truth to judge man and reveal the facts and truth of man’s corruption by Satan, so that man can get rid of sin, gradually be cleansed and changed, know God’s righteous disposition, and have reverence for Him through experiencing His work in the last days. This type of work from God is all to make man know more of His disposition, what He has and is, and His wisdom and almightiness, be more obedient to and reverent of Him and thus satisfy His will. Therefore, when it comes to a major issue concerning the Lord’s coming, if man always sticks to his own belief, regards his own conceptions as the truth and God’s intention, stubbornly clings to the wrong viewpoints such as “The Lord Jesus Christ’s name will never change,” and “Any departure from the Lord’s name is a betrayal of the true way,” and defines God’s name and His work by a set of rules, he will never meet the Lord’s return, but ultimately be forsaken by God and fall into the darkness with weeping and gnashing of teeth.